Headlines Fishing has been good to excellent over the past week with some outstanding numbers and some great sizes too. Rivers:- Have been producing some great dry fly action with hoppers, beetles and emergers. Nymphing has also been productive. Some better browns along with some fat rainbows have been taken in the Eucumbene, Thredbo and Murrumbidgee systems. Reports were a little tougher on some of the streams with plenty of fish sighted but getting them to eat was challenging. Weather and numbers of anglers may have played a part in this. WE have still been getting reports of 10 plus fish sessions from individual anglers over the past week and while not all fish are large there is plenty to have some fun with, especially if you use a lighter rod like a 4 wt. Adult dragonflie, mudeyes, ants, termites, hoppers and beetles have have made up a the majority of fish stomach contents. There are still many fish jumping for damsels and dragonflies on the wing and while they can be a little frustrating it is good to see so many fish moving. Nymphing, streamers, or small sinking mudeye patterns have been productive during the day, while muddler or similar mudeye patterns have been very good after dark. *Kieran and Justin O'Shannassy had an outstanding 37 plus fish session between them last week. They actually lost count in the end. Justin, who guides in Tasmanina, said it was some of the best fishing he has had on the lake. Just a quick email to let you know how we faired last week. Fished Yens and Frying Pan on a number of evenings and found the fishing to be rather frustrating to begin with. Trout were actively hunting Dragon and Damselflies making them very hard to target. We worked at it though and slowly caught our fair share of Rainbows, mainly on Olive Mountain Shrimps and Black Nymphs, preferably fast stripped. We found they would on the whole ignore anything slowly twitched or any form of inert presentation. Andy with one of his rainbows. They were also very out of condition for this time of year, all very thin weighing a lot less than they should have. Still it was a good couple of days and we accounted for 11 fish releasing most of them. Lake Jindabyne:- Jindabyne reports have been quiet but there have been a few reports of fish moving on top. Water temps have been a reported 21 degrees celsius which will hopefully drop with nights becoming cooler. 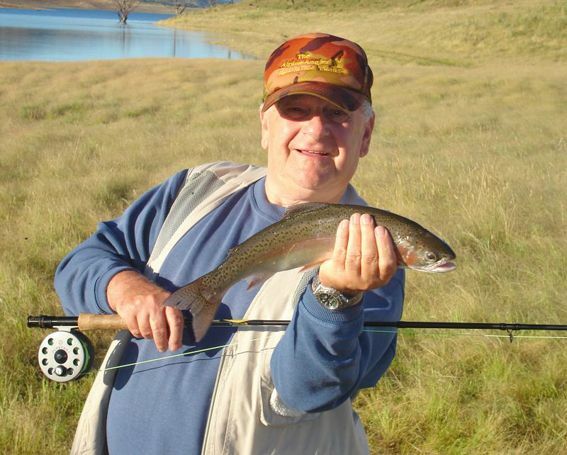 Fish quality has been better in Jindabyne but they can be a little harder to catch. *David from Sydney had a couple of good sessions trolling early morning and landed six nice rainbows and then landed browns of 1.8kg, 2.8kg and a 3.1kg. Have a look at the condition of the 3.1kg fish and the enormous shoulders on it. This fish was released after the photo. F5 and Jointed 7cm Rapala minnows were the best fish takers. All reports from Jinde have been good with some excellent quality fish being taken. Leadcore and flatlines have been working.